As we enter this period “Reign of the Super Blog Team-Up,” I’ve found myself pondering over all of the fits and starts my quest to collect every issue of Amazing Spider-Man experienced. Collecting nearly 800 issues of one comic book series was never a truly linear quest. It probably would have been a smoother journey that took significant less time than almost 30 years to accomplish if it was linear. As I’ve mentioned numerous times over the years here at Chasing Amazing, my collection has been marked by a number of gaps and layoffs that were mostly defined by some combination of my passion for the medium and my financial security. Speaking more to the former, Amazing Spider-Man #393 was actually a watershed moment for my quest that I’ve never actually talked about in the confines of this virtual space before. I could barely read when I purchased my first issue of ASM in 1987 and while I was savvy enough to understand fairly early-on in my fandom that comic books were issued in numerically serial fashion, I initially didn’t buy every issue of ASM as it came or I otherwise would have owned original copies of Todd McFarlane’s first issues of the series in real-time. Instead, I took my weekly “allowance” and purchased a wide range of Spidey books — as well as Captain America, X-Men, Superman, etc. etc. etc. Spider-Man early on emerged as my favorite (as you would probably expect) but the idea of collecting one series more seriously than another didn’t enter into my mind until nearly seven years later. At this juncture the industry was unwittingly in the dying throes of its speculative bubble period. Less than 12 months earlier, people were buying copies of “Death of Superman” and Image Comics No. 1 issues as if they were going to being able to turn around and sell them off to pay for a new house/car/luxury item of your choice. For me, I wanted to my “stock” investment to be something Spider-Man-related, and for Spider-Man fans, no storyline was hotter (in all of its bombastic glory) at that point in time than “Maximum Carnage.” After tracking down all 14-parts of that series (likely spending more than I should have, but I was a dumb teenager scouring back issue bins at local comic book shops that were probably less than a year away from experience the ultimate version of shellshock via the speculator bubble bursting), I figured I needed to start taking this whole “collecting” thing a little more seriously. And if you were a kid/teenager in the 90s interested in collecting comics, no piece of media fueled your hysteria more than Wizard magazine. Yeah, anyone who collected in the 90s is probably nodding their heads in certain agreement about Wizard magazine. For the uninitiated, while Wizard was a “price guide” by name, it’s primary stock and trade was working comic book fans into a lather about certain “hot books.” This magazine was the speculation bubble bible. But I didn’t care. I was too busy getting caught up in trying to track down first appearances of the likes of Venom, Carnage, the new Sinister Six. And as I scoured the pages of Wizard (I think I only purchased like two issues of that magazine over the years, and I’m not even certain it was published more frequently than that), I was picking up on a trend: while it was the “Image guys” like Todd McFarlane and Rob Liefeld that were connecting to many of the “hot” books at the moment, all of the more “classic” comics and series that collectors lusted after featured either the X-Men (or Wolverine) or Spider-Man. 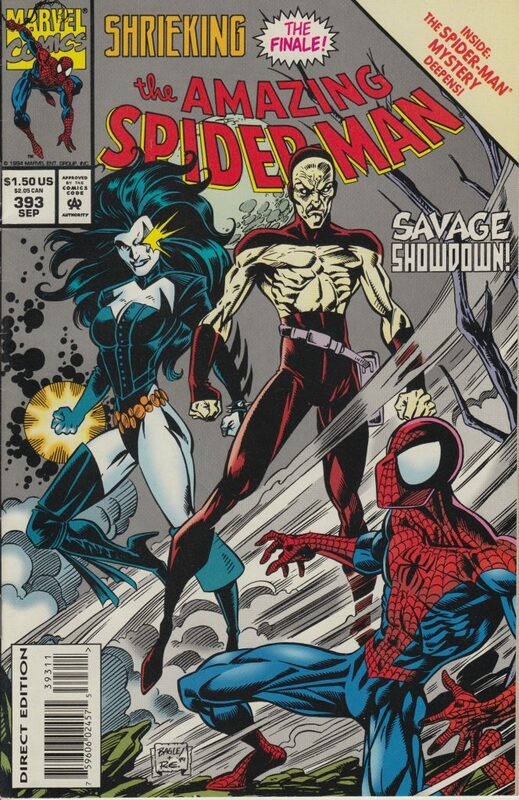 And for Spider-Man comics, no series was more classic, more essential to the character than Amazing Spider-Man, the ORIGINAL series that featured my favorite superhero. In the weeks that followed this epiphany, I went through my existing comic collection to pull out all the copies of ASM that I owned (and made the discovery that the copy of ASM #300 I thought I owned was no longer a part of my collection — but that’s a story from another post of yesteryear). Granted, at that point I still hadn’t made the determination to collect every issue of Amazing Spider-Man, but I was getting closer. So how does ASM #393 factor into this big mess of a post? Well, before I found myself neck deep in trying to purchase back issues of this series, I had visited my local comic book shop to see which issues of ASM they had in terms of back issues. They mostly had issues from the 1980s (in what I would later lovingly refer to as the Tom DeFalco/Ron Frenz run), but I figured, if I was going to start picking up old copies of ASM, I might as well also move forward with the series and get whatever the newest issue that month/week happened to be. And that’s when I saw ASM #393, with Shriek and Carrion on the cover — two villains I instantly recognized from the big “Maximum Carnage” crossover that Wizard had demanded I drop my allowance on — and figured, ok, from this point forward, I’m going to start buying every new issue of Amazing Spider-Man starting with #393. And thus a quest started to reveal itself to me. Naturally, like the “Reign of the Superman” storyline that this Super Blog Team-Up is inspired by, this important “moment” for my chase was actually just another point in the journey, but not the actual turning point that would have me chasing “for good.” You see, about a year or so after ASM #393 was published, the dreaded Spider-Man “Clone Saga” was in full swing, and 14-15-year-old me was getting burned out by the “weekly saga” of wild twists and pointless turns that arc put me through. But in retrospect, ASM #393 marked the moment in my life where I realized, collecting every issue of this series was something I wanted to pursue at some point, and it would just take the perfect combination of factors to fuel that desire for good. A pleasure, as always, Mark. You not only wrote of your own quest, but also of the history of that era. Great work! It’s always interesting to read posts about a time in comics fandom with which I am completely unfamiliar, the very end of the ’80s and early ’90s (all of the ’90s, really). My own comics-reading heyday or golden age ended just before the mid-’80s, and while I still occasionally read some stuff into the early ’90s, I was never as engaged as before. Interesting also that you can pinpoint a specific issue that signaled a change in the way you read and collected comics. Great post! Ah, Maximun Carnage. For me, it’s even worse than the whole Clone mess … at least the Clone Saga had some stories that were (take in isolation) good, whereas Maximum Carnage was terrible all the ay through. Guest heroes and villains show up for no reason, then all peel off (again for no reason) until it’s just Spidey, Venom, and Carnage left for the big fight at the end. I love Spidey, but that crossover strained my tolerance to the utmost. As for #393, I’ve read it, but I don’t remember much about it. A lot of Spidey issues from that time tend to blur together for me! Pretty much. 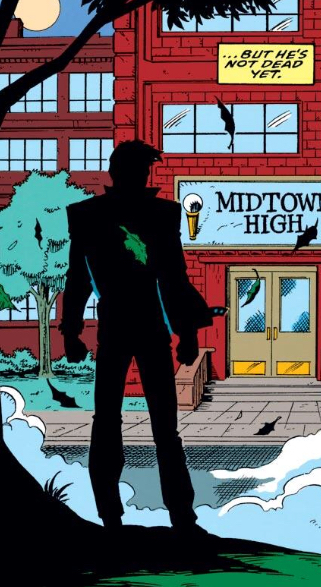 This was also in the midst’s of DeMatteis’s super dark take on the character in the 90s (as if Kraven Last Hunt and the Harry Osborn saga wasn’t dark enough). A fine article, Mark! Love your whole concept of sharing the story of completing a collection. And ASM is a tough, expensive title to pursue. Thanks for sharing your stories. I’ll definitely be back for more.